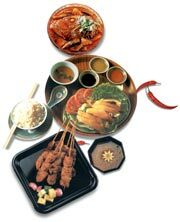 Cuisine of Singapore Singapore sizzle with a platter of cultures from all around the world. Whatever your craving, Singapore provides the very best from temples to island resorts, night safaris to orchid gardens, and tea houses to street operas. Spice Garden Walk and Cooking School: Stroll through a tranquil spice garden. Enjoy a soothing morning tea. Watch seasoned chefs prepare fabulous dishes, and try your hand at creating your own dishes. Conclude with a wonderful lunch you helped prepare. * Rates are land only. Rates are per person, double occupancy and are subject to change, availability, holiday/seasonal supplements, blackout dates and any restrictions that apply. Valid for travel through Aug 2004 & Dec 1 - Dec 28, 2004.